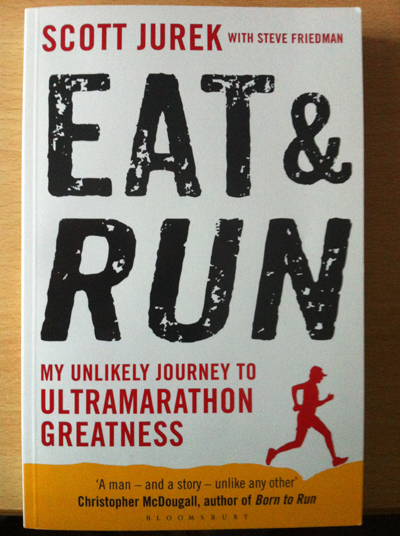 I recently read Scott Jureks autobiography “Eat and Run” and my thoughts on the book are detailed below. Scott is probably one of the few Ultra Runners that needs little introduction. He has a number of high profile race wins; 7 Western States in a row, Badwater, Spartathlon and was a former holder of the US record for the most miles in a 24 hour period (which was only very recently beaten by Mike Morton). I was looking forward to reading more about Scott’s background, training, running career in particular as some background and history for some of the bigger US Ultra races. The book initially tells the story of Scott’s upbringing in the American Midwest, his family life and pressures through his mothers illness and then moves through to his adolescent years and his interest and participation in sports and then ultimately onto his movement into Ultra Marathon running. The book then follows some of the key highlights of his career (to date) including the multiple Western States victories and other key races such as Badwater and Spartathlon aswell as his visit to see the Tarahumara tribe as popularised in the book “Born to Run”. Scott talks about some of the people who he has raced with and befriended no more so than his best mate “Dusty” (perhaps the comedy foil in the story) with whom we can credit with coming up with the term getting “chicked”. Throughout the book, Scott tells us about his gradual move towards veganism and the book is littered with recipe’s. It’s refreshing to note that the book doesn’t force his views upon you but simply offers up his perspective and feelings on his own dietary habits. The book also includes excerpts giving general advice on running technique and training. Ultra running is still a niche sport with little exposure to the mainstream public and the book did create the impression of “simpler times” during Scotts early career and only started to touch on areas like modern day press and media attention (and pressures) on runners and races towards the end of the book. Scott comes across as an intelligent, educated and well read person who has learnt his craft through the study of books, experience and seeking advice along with a lot of hard work. After finishing the book, I was left with an impression of his incredible discipline towards life from his early years and through his life from studying and ultimately long distance training and running. Overall, I found the book to be an interesting read and I enjoyed Scott’s story. The book gives a good insight on the life and motivations for one of the best Ultra marathon runners of this generation.